Fragments of a Cale Season: Hi. So, stealing a perfectly wonderful idea from Pop Songs 07 (appropriately facilitated by Hans Werksman) I figured it would be a worthwhile use of five minutes here and there to review a vast, unwieldy, and hard-to-find catalog. Hard for me to find, anyway. In the time since I've discovered him, John Cale has become one of my favorite musicians. His catalog is one of the most eclectic (eccentric?) out there, and his changes in sound and mood between (or within) albums make even Neil Young look predictable. He has recorded for around ten record labels, which makes his catalog hard to find in print. I have, if memory serves, 31 of his albums. Of those, I think five are currently in print in the US. This makes him a difficult artist to get into if you want to, not to mention a difficult artist to even be exposed to. His most famous recording by far is a cover of Leonard Cohen's "Hallelujah" - used in the soundtracks of Basquiat, Scrubs, and Shrek, not to mention the Cohen tribute 'I'm Your Fan.' It's the best version of a great-if-overplayed song, but there's so much more to his catalog. Not all of which is good, mind you. My wife's convinced that my definition of "good Cale" is far too wide, but even I have some standards. Anyway, I'll try to be objective. There are a few recordings that I consider essential to a decent record collection, but the power and uniqueness of some of his best work intrinsically limits its appeal. Anyway, there's not nearly enough writing about his work, and it's hard to get a sense of what it's all about. Not that I know, but I have some ideas at this point. And there you are. Great idea! 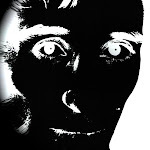 I added your blog to the links page of the Fear site. Post on my blog here. I just can't believe you do not mention Music for a New Society. If there is a quintessential John Cale record, surely it must be this. You simply can't pretend you know anyhting about John Cale if you have never listend to that one. I think this site is a brilliant idea, and really have enjoyed your writing so far. And figuring out where to even start IS the happy question we're faced with. Aren't we lucky to be living in a time when we can still be looking forward to NEW music from a giant of Cale's calibre! ?